Breast Cancer is not just an individual crisis. It’s a far-reaching social, public health and social justice problem. Although the disease goes back millennia, the modern epidemic is driven by corporate greed, discrimination, poverty, and exposure to environmental toxins. And by idenitfying the systems that contribute to the breast cancer epidemic we can, and must, work to undo them. That’s why we need your support now, more than ever. Our work is driven by our commitment to health justice not corporate profit. We refuse to allow corporate interests to take over the Environmental Protection Agency (EPA) or the Food and Drug Administration (FDA). We’ve gone up against the odds before. We challenged corporate gene patents and, with our good friends at ACLU, we won. We challenged corporate pinkwashing and changed corporate behavior. We broke through the simple narratives that sold pink products and told the truth about the breast cancer epidemic. 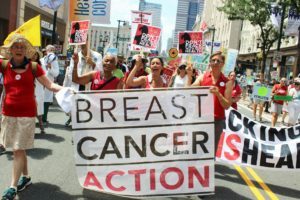 Your donation of $25, $50 or more funds our work to push back on the corporate driven agendas and fight against toxic exposures that increase our risk of cancer. Will you join the fight? Make a contribution of $25, $50, or more today!